Beto O’Rourke, alleged former punk and current Democratic candidate for president, is a man that many people really like a lot. Perhaps it’s his height, his smile, his way of saying the names of various seasonings, his tendency to stand on tables, his complicity in a developer’s scheme to gentrify El Paso in the 2000s, or his skate videos. Whatever it is, a bold teen Beto fan decided to do something about it. She held a big, hand-painted sign asking the same question again for good measure. According to CNN reporter DJ Judd, the young woman was a little bummed out that O’Rourke wouldn’t go to prom with her. 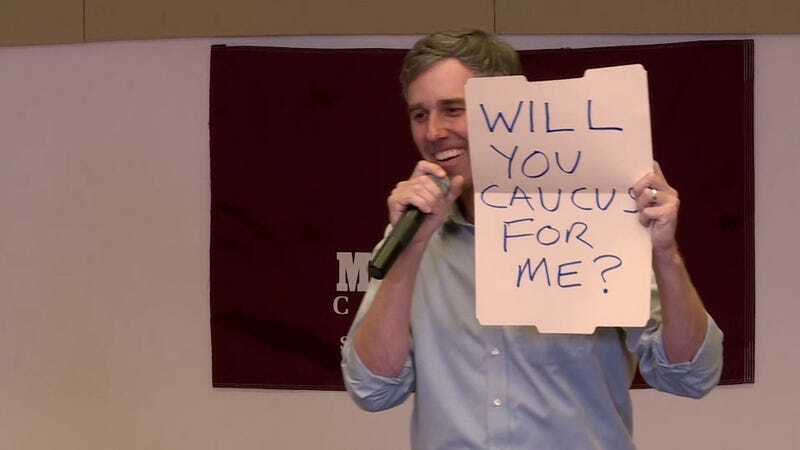 At least O’Rourke signed her promposal sign? I can understand her disappointment, but this is honestly the right choice for a man in his 40s to make when asked to a high school prom. Nice job, Beto.